← Key Court Case Coming Up for Dale Farm families- come along! The High Court ruled today that Basildon Council does not have a duty to provide ‘culturally appropriate accommodation’ for three evicted Dale Farm residents. Travellers and their supporters condemned the ruling as a blow to Traveller and Gypsy rights in the UK . The ruling follows recent criticism of the UK authorities by the EU commissioner for Human Rights for the ‘deeply regrettable’ eviction at Dale Farm. Thomas Hammarberg called for an ‘end [to] be put to violations of the right to adequate housing of Travellers in Basildon’. These criticisms were echoed earlier this month in an Equalities and Human Rights Commission report on Human Rights in the UK, which found that the ‘lack of sufficient sites means it is difficult for Gypsies and Travellers to practice their traditional way of life’ . Lawyers for the Travellers argued that forcing them into bricks-and-mortar accommodation constitutes an attempt to destroy their distinctive culture. 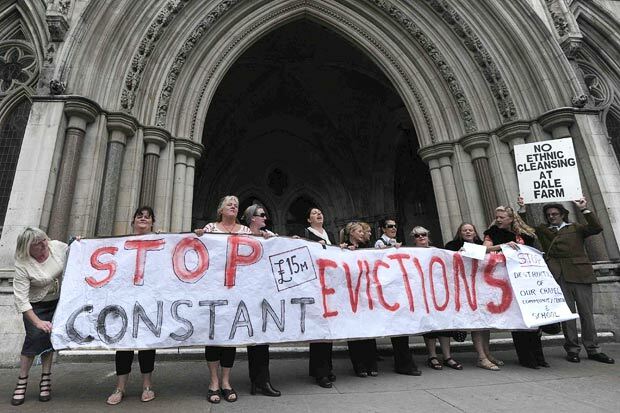 Almost all of the 83 Dale Farm families displaced by the eviction have registered as homeless and they have stated that they want a pitch for their mobile homes and not a council house or flat. However, Lord Justice Patten and Lord Justice Pitchford rejected this argument.